From the bestselling author whose debut novel, Telex from Cuba, was nominated for a National Book Award and reviewed on the cover of The New York Times Book Review comes an extraordinarily ambitious new novel about a young artist and the worlds she encounters in New York and Rome in the mid-1970s - by turns underground, elite, dangerous. The year is 1977 and Reno - so-called because of the place of her birth - has come to New York intent on turning her fascination with motorcycles and speed into art. Her arrival coincides with an explosion of activity in the art world - artists have colonized a deserted and industrial Soho, are squatting in the East Village, and blurring the line between life and art. Reno falls in with group of dreamers and raconteurs who submit her to a sentimental education of sorts. She begins an affair with an artist named Sandro Valera, the semi-estranged scion of an Italian tire and motorcycle empire. When they visit Sandro's family home in Italy, Reno falls in with members of the radical movement that overtook Italy in 1977. Betrayal sends her reeling into a clandestine undertow. 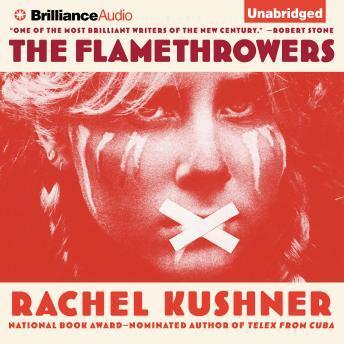 The Flamethrowers is a fearless novel, an intensely engaging exploration of the mystique of the feminine, the fake, the terrorist. In the center of it all is Kushner's brilliantly realized protagonist, a young woman on the verge.